Today, August 31st, is Blog Day, a day for bloggers to recommend 5 new blogs to their readers, "preferably blogs that are different from their own culture, point of view and attitude." The writer takes a photo almost every day of something she is grateful for. This is one of the first blogs I ever read and it is still a favorite. They post photos of cupcakes from cupcake bakeries all over the world, and from readers who submit photos of their own creations. When I travel, I like to visit the local cupcake bakery. I use this blog to find them. "I’m a thirty-something ranch wife, mother of four, moderately-agoraphobic middle child who grew up on a golf course in the city. I attended college in Los Angeles and wore black pumps to work every day. I ate sushi and treated myself to pedicures on a semi-regular basis. I even kissed James Garner in an elevator once. Then, on a brief trip to my hometown, I met and fell in love with a rugged cattle rancher. Now I live in the middle of nowhere on a working cattle ranch. My days are spent wrangling children, chipping dried manure from boots, washing jeans, and frying calf nuts. I have no idea how I got here…but you know what? I love it. Don’t tell anyone." Cakespy is a "Dessert Detective Agency" that writes all about bakeries and baking. It is often illustrated with cupcake cartoons by Jessie Olseon. Her recent comic strip, Cuppie Capers: "The Talk" made me laugh. I got an email today saying that Have Fun * Do Good has been nominated for a Love! This Site Award from DivineCaroline. If my site gets the most votes in the "neighborhood & world" category, I have a chance to win a $250 Visa gift card. That seems highly unlikely since other folks in the category include blogs with huge readerships like the Huffington Post, Treehugger and Wonkette, but heck, if you're feeling it, log into DivineCaroline and vote for Have Fun * Do Good before November 30, 2008. Big thanks to whomever nominated me! Ask Britt: Using Twitter to Answer, "What Tools Can I Use to Teach Classes Online?" "What Tools Can I Use to Teach Classes Online?" I actually didn't know, so I asked my Twitter network. Twitter is a micro-blogging and social networking tool. You "tweet" 140 character posts which your "followers" can read. You can also be a follower of other people's tweets. It's a super useful tool for tapping the collective wisdom of your network. 1. @NancyWhite of Full Circle Associates suggested using a Google Group, a blog, or Moodle, a free, open source course management system. She also said I should check out the work of @leighBlackall at Otago Polytechnic. 2. 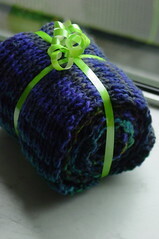 @wakot of everyday sustainable suggested I contact Karen Henke of Nimble Press for ideas. 3. @jchou suggested screen sharing with iChat. 4. @santhonys of AShowalter.com suggested using the haiku Learning Management System, which on first glance looks pretty easy to use and ranges in price from free-$30/month. 5. @amoration of AMO: The Root of Love also suggested Moodle, and Sloodle which integrates Moodle and the virtual world of Second Life. She also said that she uses wikis. Pretty cool, huh? Thanks Twitter pals! @helenrf of Reach Further teaches writing online with Moodle, but also suggests WordPress blogs and forums. @PinkHeels of Pink Heels uses Moodle with her university students. You can email your question (please keep it to 50 words) about the do-good, or artistic work you are doing, or want to do, to britt@brittbravo.com. Title your email, "Ask Britt: your question topic." I won't post your name, but I will post your question with my answer, so keep that in mind as you write if you don't want details in your question to identify you. Why Do You Do What You Do (wdydwyd)? In a recent blog post, Lara Galinsky of Echoing Green talks about how each new Echoing Green Fellow is asked to answer the question, "Why do you do what you do?" "It gets to the heart of what we believe is one of the most important attributes of social entrepreneurs – self-awareness," writes Galinsky. Why Do You Do What You Do (wdydwyd) is a community art project created by social entrepreneur, Tony Deifell, that asks people to combine an image and text to answer the question, "Why do you do what you do?" Galinsky explains that Deifell came up with the idea for wdydwyd when, "[H]e realized he didn’t have an answer when asked. Having started several nonprofits, he was doing, doing, and more doing. Perhaps, like many of us, he took the Why for granted?" It's a tough question when you really think about it. Why do you do what you do, particularly as it relates to trying to create positive change in the world? * So the next generation can live without worry. * To give people hope in uncertain times. * To be of service. But honestly, when you get down to it, most of the things I choose to spend my time on, I choose because I think they're fun. Not very deep, but it's true. You can add your wdydwyd photo to the wdydwyd Flickr group, and join the wdydwyd Facebook group, or wdydwyd Ning group. You can see the Echoing Green Fellows' answers to wdydwyd on the Echoing Green home page. Full disclosure: I've worked for Echoing Green. Photo of me by the hubs. In early May, I wrote a post asking all of you for suggestions for "changebloggers," people who are using their blog, podcast or vlog to raise awareness, to build community, and/or to facilitate readers/listeners/viewers' taking action to make the world a better place. 1. Changeblogger Ning social network to connect with other changebloggers. 2. Changeblogger Facebook to connect with other changebloggers. 3. Changeblogger wiki to list your changeblog, podcast or vlog (set up by SocialButterfly). 4. 1st D.C. Changemakers/Changeblogger Meetup on October 15. Alex Steed will be there as a stop on his Millennials Changing America: The Next Generation of Organizing tour (which you can donate to, like Beth Kanter did). Brazen Careerist bloggers will be there as well. What is one change - big or small, local or global - you want to see in your lifetime? Who is already working on this issue that you think others should support? How are you going to use your Web/tech/marcom skills to further this cause? Ask Britt: How Do I Promote My Do-Good Book Online? "How Do I Promote My Do-Good Book Online?" You can also search for bloggers writing about your specific topic on Google Blog Search, Technorati and Ask.com's Blog Search. Before you draft your blogger outreach email, check out my 10 Tips for Asking Bloggers to Write About Your Cause. I first heard about virtual book tours through Kevin Smokler. Basically, a couple months before your book's release you contact bloggers, podcasters and vloggers whose audiences are a good fit for your book and ask them if they would like to interview you, review your book, have you guest post, or host an interactive event with you using a service like Gabbly. Isn't it frustrating when your favorite author comes to town and you don't hear about it till 3 hours before? BookTour.com is a free directory created by Kevin Smokler, Chris Anderson and Adam Goldstein that makes it easy for book lovers to find out what authors will be coming to their town. Add your events so that can find you too. After watching the Michael Franti video for his new song, Say Hey, I can't wait for his new album to come out next month. Some authors are also creating video trailers to generate excitement around their book launch. You can see some fancy examples on BookVideos.tv and the BookVideos.tv YouTube channel. There are a lot of social networks out there where you can meet with present and potential readers. Facebook and MySpace are of course the biggies, but you might want to consider creating a presence on a do-good social network like Change.org, Care2, Just Cause, Razoo, WiserEarth or World of Good too. Here is an example of author Kim Keltner's page on Gather.com, a social network oriented for folks over 30. You may also want to start Twittering. Twitter is a social networking and microblogging tool where news travels fast. You can find other Twitterers who are interested in your book's topic on the TwitterPack wiki. Everybody loves to win, and contests move quickly over the web. • A video book trailer, or video book review contest. The winner gets a Flip Video camera. • Flickr photo contest. The author of Social Software in Libraries hosted an Alternative Book Cover contest. The winners got signed copies of her book and were announced at the Computers in Libraries Conference. • Send bloggers copies of your book to give away as prizes for their own contests. Photo Credit: Photo of me answering your questions (: taken by my hubs. Lots of do-good bloggy "Days" coming up! A day for bloggers to recommend 5 new blogs to their readers,"preferably blogs that are different from their own culture, point of view and attitude." For more info. go to www.blogday.org. Bloggers, podcasters and vloggers post about the same issue on the same day to facilitate a global discussion. The theme for 2008 is poverty. For more info. go to blogactionday.org. Similar to Blog Action Day, Bloggers Unite is a day for bloggers to write about one subject. This year's theme is refugees being separated from their families. Bloggers Unite has partnered with Refugees United for the event, a search engine that allows refugees to search anonymously for their friends and family, as well as to register themselves so that they can be found. For more info. go to unite.blogcatalog.com. About three years ago, I watched a fabulous documentary series sponsored by the Skoll Foundation called The New Heroes. The series featured stories of 12 social entrepreneurs including Martin Fisher and Nick Moon, the co-Founders of KickStart (which was called ApproTEC at the time of the series). KickStart is a nonprofit that develops and markets new technologies in Africa that help local entrepreneurs to establish small businesses. The organization has received numerous awards for its work, and Fisher recently received the $100,000 Lemelson-MIT Award for Sustainability. Their story was one of the ones that stood out the most for me from the series, so I was thrilled when a woman named Houria Iderkou, who set up a Causes campaign for KickStart on Facebook, contacted me to see if I'd like to interview Fisher. What follows is an edited transcript of our conversation on July 2, 2008. 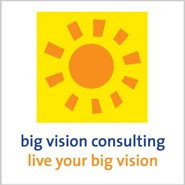 You can also listen to it on the Big Vision Podcast. Martin Fisher: The problem we're trying to solve is global poverty. As we've heard, something like 18% of the people in the world live on less than $1 a day, and a much bigger percentage live on less than $2 a day. The reality is, actually, that these people who are living on less than $1 a day, for the vast majority of them, it's more like $1 per family, than it is $1 per person. Many, many of these people are actually living on more like 15, 20 cents a day. As long as we have massive global poverty, we really can't solve any of our other biggest problems because if you have people who are starving, they're going to do anything to stay alive. They will absolutely destroy the environment, and it will be the breeding ground for wars, for civil strife, for terrorism, and for refugees. Unless we solve this problem of global poverty, the other problems won't be able to be solved. Britt Bravo:What is KickStart doing? What are the tools that they are using to work on this? MF: Our mission is to take millions of people out of poverty, and we do this by first of all recognizing a couple of things. The first thing we recognize is that poor people everywhere are really not that different than us, in that they live in a cash economy, and just like us, if they have a way to make money they can access education, clean water, health care, and all of those other things that we think about as being so important. If they don't have a way to make money, they can't access those things. So, a poor person's number one need anywhere in the world is actually a way to make more money. If we're going to solve poverty, we have to find a way to enable literally millions and millions of people to make a lot more money. The other thing you realize about the poor is that they're extremely hard working, and extremely entrepreneurial. They literally have to be just to stay alive because they can't live without a way to make money. They can't live without money, and they find a way to do it. They're not looking for handouts; they're looking for opportunities to get ahead, just like we are. We want an opportunity for a better life, to have our kids have a better life, and if we can simply provide them with that opportunity, they'll do the rest. They're going to work hard; they're going to lift themselves out of poverty. Now, of course, in this country if you want to make money, the easiest thing to do is go and get a job. But, in Africa, where we work, there are very, very few jobs in the formal private sector. For example, in Kenya, only 7% of the population, of the labor force, has a job in the formal private sector. In Tanzania, only something like 3.5%; in Sudan, it's only about 1.5%, and even in India, which we think of as being more developed, it's only about 10% of the people who actually have a job in the formal private sector. All of the other people are involved in what we call the informal sector. They have to make money to stay alive, and so they literally do whatever they can to scrape a few pennies together. Now, the vast majority of them are doing petty trade, where they sit on the side of the road and buy and sell things. Whether it's second-hand clothes, or it's food things, they're all competing with each other. Their profit margins are pretty small. And then, you have other people who are maybe doing tailoring, or carpentry, or metal work, or food preparation. But, really there is very, very little diversity in the informal sector - everybody is competing with each other; everybody's trying to do the same thing. They're all making a little bit of money. If they weren't, they literally would be dead, because you can't live in these countries without a way to make money. But, they're not making enough money to actually get out of poverty. And the reason for this is precisely because they're in the wrong businesses, precisely because they're all competing with each other and doing the same thing. And so, coming up with a brand new business idea is actually very, very difficult for a person who has very little education, who has very little exposure to media. They don't watch TV, they don't move far from their village. And in Africa, very often people don't even leave their farm except for a few times a year to go to a town. It's very hard for them to come up with a better business idea. The second problem they have is that even if they do come up with a great new business idea, they can't access the tools and equipment they need in order to make that business viable - tools and equipment that they can afford to buy and afford to operate and that are going to be profitable to use - these things, it turns out, just aren't available. They're certainly not available in that local marketplace in Africa, but it turns out, they're also not available anywhere in the world because people simply don't design tools and equipment for very poor people. The reason we don't is because it's a market failure. It's hard to sell it to them, and they can't afford a lot of money. So, you can't make a lot of money doing this. What KickStart does is tries to solve these two problems. First, we needed to identify what businesses could literally thousands and thousands of people start, which were going to be very, very profitable, and that they could start with a very small investment - an investment of somewhere between maybe $20 or $30, and a couple of hundred dollars, and that would be so profitable that they would make their money back in three to six months. The reason it has to be three to six months is because these people are farmers, most of them. And they're used to putting their seeds in the ground, and their labor in the ground for three to six months and then they get their harvest. If you start talking to them about one year or two years, they're not very interested. So, we talk about farm-time; if they can make their money back in farm-time. We design the tools and equipment, and then we mass-market them to these very, very poor, but very entrepreneurial entrepreneurs, who buy the equipment and start highly-profitable businesses. We started off with equipment, for example, in Kenya, for manufacturing low-cost building materials. We have a machine for making very strong building blocks out of soil and cement, where you can press them at a high pressure, and you get a strong building block, and it's a very low-cost building block. This machines costs about $350 - $400. It's a fairly big investment. Nonetheless, the people who have bought this machine are actually doing very well with it, and have created about a thousand businesses for people who have bought these machines, and are employing a lot of people manufacturing building blocks. Then, we got into a machine for manufacturing cooking oil from sunflower seed. You manually operate the machine because nobody has electricity, petrol is far too expensive, and engines are far too expensive. You simply drop the sunflower seed into the hopper. You pull the handle up and down. On one side, you get high-quality cooking oil, and on the other side you get a high-quality animal feed, which is sort of a waste product. And this is, again, a very, very profitable business. This machine is about $350 - $400, and we have about a thousand people who have bought that machine and started highly-profitable businesses too. But then, we asked ourselves, well, we're working in Africa, what business can your average African start? Now, your average African is a poor, rural farmer. In fact, 80% of the poor in Africa are poor, rural farmers. In fact, one-third of people in the whole world are poor, rural farmers; one third of all the people. A poor, rural farmer, basically, has two assets. They have a small plot of land, and in Africa, very often that might only be a half an acre, sometimes even only a quarter acre. If you're lucky, you have maybe two or three or four acres where you can farm. And you have your number one skill, being a farmer. If you have a number one skill, and one asset, a plot of land, the best business you can get into is to use those two things to start a new business. The best thing you can do is to move from basically staple food and subsistence farming, where essentially you wait for the rain to come - which comes once or twice a year - and you grow a staple crop such as maize or rice or potatoes. You move away from that, to growing high-value crops with irrigation. Because all of a sudden, if you can irrigate your farm, instead of waiting for the rain once or twice a year, you can now grow and harvest crops throughout the year. You can grow high-value crops like fruits and vegetables. You can get very high yields because you have the right amount of water. And most importantly, you can bring these crops out in the long, dry season when nobody else has any crops at all, and the price is very high at this time. You could make a huge amount of money if only you could irrigate. But, there were no technologies for irrigation. Petrol pumps are far too expensive. and there is no gas in the rural areas, and there is no electricity. Only 10% of all the people in Africa have access to electricity, and that's only the few in the cities. 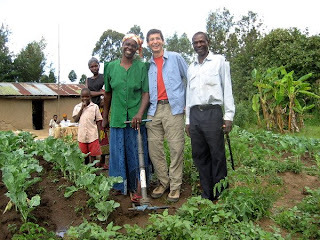 What we did is we designed a line of human-powered irrigation pumps that we call the MoneyMaker irrigation pump, because a poor person's number one need is a way to make money. Our best-selling pump is called the Super-MoneyMaker. It's operated like a small StairMaster machine. It looks very similar to a small take-home StairMaster machine, where you walk back and forth between two treadles, and each time the treadle goes up and down, it drives a piston into a cylinder, and that pulls water from a well. You have a hosepipe that goes down into a well, or into a pond or into a river, and it pulls water into the pump. It can go down as deep as 30 feet. Then, with another hosepipe, you can push the water out through that hosepipe, under pressure, and this hosepipe can be hundreds of feet long, or it can go straight up another 30 feet or so. So, it's a pressurized irrigation pump. The great advantage of doing pressurized hosepipe irrigation is it is actually very efficient because you can now either spray directly onto the plants with the end of the hosepipe, or you can actually take the hosepipe and direct it at the roots of the plants. It's a very efficient form of irrigation. With this small pump, you can irrigate over two acres of land. When I say that, what I'm saying is that if a farmer works for a couple of hours in the morning and a couple of hours in the evening, they can irrigate up to two acres of land, or even more. In fact, some farmers are irrigating as much as 3-1/2 or four acres of land with these little pumps. Now, when you do this, you actually make a huge amount of money. On the average, a farmer will increase their net farm income by $1,000 a year when they buy one of these pumps and start irrigating. This Super-MoneyMaker Pump retails for $100 in Africa. We have another pump we call the MoneyMaker Hip Pump. The MoneyMaker Hip Pump looks a lot like a bicycle pump except the trouble with a bicycle pump is that you pull your arms up and down, and you use your arm muscles, and your arm muscles get very tired, very quickly. You can only pump, maybe for three or four minutes without getting very tired. Instead, what we've done is we've taken something that looks like a bicycle pump, and we've pivoted it from the end of a small base. So, you now stand on that base, and the pump is coming up at a slope. You can grab the pump with your hands. You can now, by simply rocking back and forth - we call it a hip pump because it's really a rocking hip-type motion - you can pump on this little pump and pump a lot of water. And this is a motion you can do all day. It's very ergonomically efficient. With this little pump, you can pump and irrigate over one-and-a-quarter acres, with this little tiny pump. This pump retails in Africa for $35. People are irrigating and making $1,000 profit even from this small pump. One thousand dollars a year profit is a huge amount of money because these families are typically living on something like $400 to $500 per year, before they buy a pump. All of a sudden now, they're living on $1400 - $1500 a year. This literally takes them from below the poverty line into the middle class. For the first time, not only do they have enough to eat, and they can feed their kids, and they don't have to worry about where the next meal comes from, they can also send all their kids to primary school, including their sons and daughters. They can afford basic health care. They have enough clothes, and they have a decent house to live in. Most importantly, they have a little bit of money left over to invest in the future. Really, when you think about what being out of poverty is, it's about having money to invest in your future. You're no longer worried about survival. You can now actually think about the future, and figure out how you're going to get ahead. So, what do they do with this money? They do all sorts of things. Very, very many of them, actually, will use this money to start another business. They'll buy a couple of cows and start a small dairy with the money. Or maybe they'll buy a maize mill and start grinding maize. Or they'll go out and buy a slightly bigger, maybe a petrol pump, and start irrigating a much larger area. Very many of them send their kids on to secondary school or college as a result of having this extra money. So far today, in Africa we have over 65,000 families who've actually bought these small irrigation pumps and used them to get their families out of poverty. BB: Can you tell a story of how one of these tools made a difference in a family's life, or an individual's life? MF: Let me tell you a story about a young man and his wife. His name is Felix, and his wife is Lucy. They're a very, very typical African couple; a young couple with three young kids. They live about 40 miles outside of the big city in Kenya, Nairobi. They live on his father's farm. His father's farm is about 1-1/2 acres. But they don't have any land of their own because his father only has 1-1/2 acres and they couldn't afford to buy any land. In fact, they couldn't even afford to send their kids to school, and they could barely afford to feed their kids. The young man had to go to Nairobi to look for a job. This is a very, very typical story; if you don't have a way to make money, you go to the big city. Nairobi is a city with three million people where over 2/3 of the people live in very, very poor slums. He went and he finally found a job in the slum, working in informal sector restaurants serving food. He was making about $1 a day at this job. On that dollar, he not only had to find a place for himself to stay in the slum, but also try to send home whatever was remaining at the end of the day. So, as you can imagine, there's not a lot that actually got home. Nonetheless, this is how very, very many people live. Then, he saw one of our little $35 pumps. He said, "OK, that thing is expensive, but if I had that thing I could really have a much, much better life at home. Even though I don't own any land, I could figure out a way." He saved up his money and eventually managed to buy one of the pumps. He went back to his home area and rented six little plots of land that between them made up one acre of land. He started growing kale, he started growing corn; he started growing some French beans. Three months later, in his first harvest, he sold his produce and made $1100 profit. On top of that, he rented out the pump for $1 a day to one of his neighbors. That was a couple of years ago. We just went back and visited this particular guy about a month ago. At this moment, he has 2,000 tomato plants in the field. He's going to get about 80,000 tomatoes off of those plants, and he's going to sell them for $6,500. This is a crop which has taken him just over three months to grow. On top of that, he's also growing some beans, some French beans, which he's going to export. So, you can see, this tiny little pump, $35 pump, where he now is irrigating over 2-1/2 acres with this, has completely transformed his life. This is why we call it KickStart. It's not that this pump is the end of the journey; this is the beginning of the journey. It's the first step out of poverty for these families. They buy a pump and now they're on the road. Their kids are going to have a much, much better life than they ever had. BB: What are the challenges to making this work? MF: The very, very biggest challenge is that what we're trying to do is to overcome a major market failure. As I said a bit earlier, large companies, or any companies, are not going to design tools and equipment for the very poorest, most risk-adverse, hardest to reach customers in the world. It just doesn't sound like a good business, and frankly, it is not a good business. In fact, trying to introduce a new technology to these people is extremely difficult, extremely hard work. So, what we do is we use donor funds to overcome this market failure. As with any new technology anywhere in the world, when you very first introduce it - whether we're talking about cell phones in America, or we're talking about color TV in America, or we're talking about making purchases on the Internet - when you first introduce this, nobody wants it. Nobody knows about it. It took us about 15 years in America before cell phones actually took off, and people started buying a cell phone. Color TV, it was about 20 years before it took off. The Internet, it took 10 - 15 years, also, before anybody started doing this on a large scale. And that's selling to the wealthiest people in the world in a place where marketing infrastructure is huge and everybody watches TV. And we're selling very low-cost items. What we're talking about is selling a very expensive, big-ticket item. These pumps are something like a quarter to a third of somebody's annual salary. They don't have any savings, and they don't have any credit. They're now going to buy this thing and if it fails, they're going to go hungry for months. It's a technology they've never seen before. It's something that they have never even dreamed could exist. What we're doing is saying, "Go out and buy these things." When you first start introducing a new technology, you have to do a huge amount of advertising and promotion. That's true in America, but it's even more so where we're working. So, what we use our funds for is precisely to do market development. We go out and we have live demonstrators in front of every retail shop. We do live demonstrations on the farms. We use huge billboards. We use radio and radio advertisement. Not everybody has a radio. Not every family owns a radio, and even when they do, they don't have the batteries to have the radio operate, except maybe half the time or a quarter of the time. But, when somebody does have a radio, people gather around and they listen to radio advertisements. We use newspaper advertisements. Again, not everybody reads the newspaper in Africa. I think every single newspaper is actually read by 20 to 30 people on average. That's not every issue. It's actually every paper, so it gets passed around. We have pumping competitions. We do all sorts of promotions and say, "You want to get out of poverty? Go down to your shop, buy an irrigation pump and get out of poverty." This is what we use our donor funds for, and this is by far the hardest job. Designing a new irrigation pump for poor people? OK, it's a challenge. It's got a lot of interesting design challenges, but you can have the very best technology in the world, and if you don't get it out there and market it, if you don't have a distribution network, then it doesn't have any impact. So, we have to set up a distribution network, a private sector distribution network where we have private manufacturers producing these things, wholesalers selling them, and hundreds of retail shops that final retail them, and then, all of this market development. That's our challenge. Eventually what will happen, of course, is that these pumps will hit a tipping point where everybody knows about them, and they become as well known in Africa as, say, a sewing machine or a bicycle. You will no longer will have to tell people, "This is an irrigation pump. This is what it is used for." At that point, the amount of money you have to spend on market promotion will be much, much less. Sure, you might have different retail shops competing with each other for a customer, or you might have a different competitor come in with their own design of a pump who is now going to be competing, but you no longer will have a market failure, and you will be able to actually leave in place completely sustainable, completely profitable businesses that will sell very, very useful irrigation pumps to very, very poor farmers. This is our strategy and our plan, and we use donor funds to do that. We are hoping to get to this tipping point in any particular country in about 10 to 15 years. BB: What's the path that brought you to this work? MF: I have a PhD in mechanical engineering from Stanford and I realized that the more education I had the less I could do. I was uniquely qualified to teach at the university, if I had anything to tell anybody, or to work for big oil, or to work in military research. None of those things interested me. I was an idealistic young man and thought that I wanted to try to do something more interesting than that. I went off to Peru and went trekking in the mountains, and came face-to-face with developing country poverty for the first time, and thought well, maybe something could be done with engineering, and design, and poverty. I applied for a Fulbright Fellowship to go back to Peru. They told me, "No, no, you don't speak Spanish. You're not going to Peru." I looked into their catalog and realized that they speak English in Kenya, and ended up going down to Kenya on a Fulbright. I went down for 10 months and stayed there for 17 years. The first five years I was in Kenya I really learned a lot of lessons about what does not work. I ended up working for a large nonprofit called Action Aid, very similar to Save the Children. They did many of the typical things that we do in development. I established a large rural water program, where we went into communities, and we would work with the community to decide that yes, one of their needs was clean water. We would dig a well. We would provide a pump. We would have community inputs and labor, and at the end of the day, there would be a nice pump sitting on this well with clean water coming out of it, and the community had clean water, and everybody would celebrate. I did other things. I started a workshop to mass produce farm equipment; in that case, plows, harrows and ox carts that we gave away to local farmers. I also worked with youth groups and women's groups setting them up in small businesses with some of the technologies that I designed for making low-cost building materials. We would donate the machinery to a group, and set them up in a small business, and they would produce roofing tiles or building blocks. All of these things sound great and look great. The trouble is, none of them are sustainable. You walk away from them, and they all fall apart. This, unfortunately, is the story of international development. You put that water source in the village. As long as the pump works, everybody is happy. Three years down the road, the pump breaks down, and nobody fixes it. It's a matter of the tragedy of the commons. Why should I fix it if you are going to get water from it? Why should you fix it if I'm going to get water from it? We all go back to our old ways, and Africa is absolutely littered with tens of thousands, if not hundreds of thousands, of broken down community water pumps. The workshop we started to mass produce farm equipment; again, it sounds great, but we were subsidizing it with our donor funds. We were giving away this equipment to farmers who didn't really appreciate it because it actually wasn't what they wanted. They weren't vested in it, and much worse than that was that when our donor funds ran out and we closed down the workshop, the farmers were much more worse off than they had been before because the private sector workshop down the road couldn't compete with the workshop that was giving things away for free, so it's now out of business, and the farmers now have no access to farm equipment at all. The youth groups and the women's groups that we set up, well, these were not entrepreneurs. We had artificially set up these groups. We walk away from them, and the group falls apart, and you no longer have a business. Again, the entrepreneur down the road who wanted to get into that business while we were holding the hands of the group and supporting them, couldn't compete because it was a subsidized business and probably went out of business. So, very often, not only does development aid not do a whole lot of good, but it can actually do more damage. As we were learning these lessons by doing them, we also learned the lesson that I've already mentioned, that a poor person's number one need is a way to make more money, and that the poor are very hard working, very determined, and very entrepreneurial. If you give them an opportunity, they will grab that opportunity and get out of poverty themselves. BB: What advice do you have for aspiring social entrepreneurs? MF: I think, the number one bit of advice is if you are going to run a social enterprise to try to help people in developing countries you have to go to those developing countries. You have to spend time there. You have to understand the people. You have to understand the problem. You have to understand the marketplace. If you don't do that, if you don't take the time to do that, you will simply be coming with some outside solution, which really has no chance of being sustainable, no chance of really helping people. Like I say, it is easy to put values on what we think a poor person's number one need is, "Oh, clean water is by far their biggest need, or education, if they only had education everything would be great, or actually, health care is their number one need." When you get there, and you talk to a poor person, you find out very quickly that a way to make more money is their number one need. If they have a way to make more money, all of these other things fall in line. If you are going to try to solve poverty, you've got to help people to make more money. Once they make more money, to be honest, they'll be healthier. They'll look after their environment better. If they don't have money, they're not going to look after their environment. They are going to cut down every tree to try to feed their family. If they have money, they are going to be planting trees. Really, it's a matter of understanding the people you are trying to help, and understanding what their real problem is and what the real opportunities are to help them. BB: How can people get involved with KickStart? How can they help? MF: Well, of course, we're always raising funds. Every $300 will take another family out of poverty, and that's certainly the way that most people can help us. We do occasionally have internships, but not very many, and only for people with highly developed skills in mechanical design, or with highly developed business skills and degrees. We don't have a program where we take volunteers over and try to put them to work because there are plenty of people in Africa who can do that work, and who need that work. Certainly, the easiest way and the best way to help us would be to help us with some funds. Birthday Blog: 3 for the Blog and 39 for Me! Today is Have Fun * Do Good's three year anniversary and my 39th b-day. 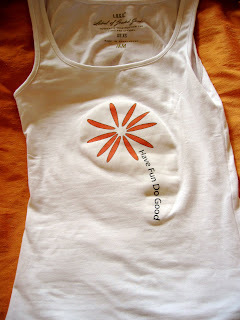 My husband made me this awesome t-shirt (pictured left) with a beautiful Have Fun * Do Good flower that he created. I just love it. I've spent the morning working at home alternating between listening to Pandora Internet Radio (my new favorite thing), and listening to Michael Franti's newest song, "Say Hey" on YouTube over and over. You gotta check it out. I posted the video at the bottom of the post for you. I just want to say thanks to everyone who reads Have Fun * Do Good, posts comments, and forwards posts to friends. I really appreciate your readership and participation. 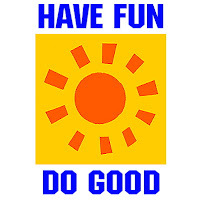 Don't forget, you can find other Have Fun * Do Gooders on the Have Fun * Do Good Facebook group. What Changemaker Authors Have Blogs? I'm speaking tomorrow at the Writing for Change Conference in San Francisco about "Changeblogging: How to Create Positive Change With Your Blog." The conference is for nonfiction writers who want to write books that will create positive change, "from the personal to the planetary." I've been creating a list of changemaker authors who have blogs. The blogs could have been created as a platform for a particular book, evolved into a book, or simply be a part of the author's overall web presence. I'd love to hear your suggestions for changemaker authors who have blogs. I know I'm missing a lot of people. My list is rather heavy on "green" topics. I'd like to see examples from other fields like politics, culture, business, technology, spirituality, health, nutrition and personal development. 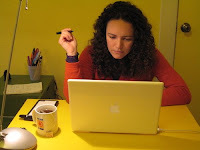 Ask Britt: Work for Idealistic, Introverted Writer? Last week I answered the first question in my Ask Britt series, How do you make a second hand bookstore a force for good? I'm extremely introverted. I want a job that involves working with information about people. My strongest skills are writing and counseling. Full-time work as a counselor doesn't give me enough quiet time during the day. Freelance writing? I'm not good at creating a structured work day for myself. Any ideas? Copywriting? Creating website content for universities, non-profits, or artists? To generate a longer list, I would recommend trying an exercise that I learned from Carol Lloyd when I taught her Creating a Life Worth Living workshops. You'll find a version of it in her book Creating a Life Worth Living: A practical course in career design for artists, innovators, and others aspiring to a creative life. Make a list of all of the skills you like to use professionally and personally (i.e. writing, research, counseling, baking.). Make a list of all of the fields that interest you (i.e. literary arts, politics, architecture). Once you've completed your list, ask a friend, or a group of friends, to read your lists and brainstorm job ideas that combine elements from 2 or 3 of your lists. The only rule is that you can't say "no" to any of their ideas. Just let them brainstorm away. When they're done, add some more of your own. Now read through your entire idea list, circle 2-3 ideas that sound exciting to you. Think of one small step you could take to research what doing that kind of work would be like (i.e. read something about it, talk to a friend of a friend who does that kind of job, volunteer at the place you'd like to work). By taking small actions toward researching ideas that interest you, you'll end up eliminating some, and following others. Cupcakes + a good cause = Fun + yum. Cupcakes Take the Cake posted yesterday about Cupcake Day for the RSPCA. On August 18th, Australian supporters of the RSPCA (Royal Society for the Prevention of Cruelty to Animals) will bake and sell cupcakes to benefit the organization. The event's website, www.rspcacupcakeday.com.au has all the information you need to participate, as well as a recipe for "pupcakes" for your dog. Selling cupcakes to benefit animals seems to be a popular theme. Check out Ace of Cupcakes' photos of dog-related cupcakes they made for a fundraiser, and these Flickr photos of 100+ cupcakes a woman baked to benefit the Western Pennsylvania Humane Society. The 5th Annual Cupcakes for a Cause will be happening October 20-26th this year. They are asking bakeries to donate a portion of their sales from select cupcakes to CancerCare for Kids. You can also participate by hosting a bakesale for CancerCare for Kids between now and November 1st. For more information, go to the Duncan Hines National Bake Sale Contest site. A co-worker of ToRoxy, baked cupcakes that look like sushi to sell at their office as part of Cupcakes for a Cause. I think it would be awesome to have a fundraising/friendraising event that revolved around an Iron Cupcake competition, like the folks at Iron Cupcake Earth are doing. (Iron Cupcake is a play on the name of the Japanese cooking game show, Iron Chef, where two chefs compete to create the best meal using one ingredient). This month's Iron Cupcake challenge is to develop a cupcake (that tastes good) using chili peppers. What other examples have you heard of for how to use cupcakes for good? Photo from my cupcake tasting party a few years ago. Olympic Protest Campaigns: Which is More Effective? The Olympics open today in China to a multitude of emotions, including anger from Tibetan, Darfurian, and Burmese human rights activists about China's role in the conflicts in these countries. To protest China's financial support of the genocide in Darfur, actress Mia Farrow is hosting a daily webcast report from a Darfurian refugee camp during the first week of the Olympics (August 8-15). They are asking people to Switch Over to Darfur, and watch the webcasts when sponsors' commercials air. On the other hand, Avaaz is promoting the Olympic Handshake. On May 22nd, Avaaz organized a 3-mile long "human chain handshake" of 2000 activists in London that began with the Dalai Lama, and ended at the Chinese Embassy. Participants wore T-shirts that said, "Give Real Talks a Hand" in English, and "One China--Talks on Tibet" in Chinese. The handshake is being continued during the Olympics as an online initiative. After you join the Olympic Handshake, you can view a video of the handshake's path around the globe, and learn who you virtually shook hands with. I shook hands with, "Kittner of Roseburg, Germany, part of a chain of 85,626 people in 192 countries who have joined the global handshake." I think both kinds of campaigns are important, but I do find the Olympic Handshake to be more appealing. It inspires, not tires. What do you think? Last week I announced a new weekly feature that I'm trying out on Have Fun * Do Good, Ask Britt, where you send in questions related to career design for artists and activists, and I'll do my best to answer them. I encourage you to add on to my answers in the comments. 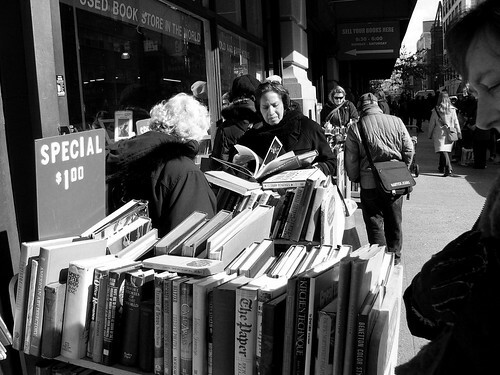 My husband has recently linked up with a friend to buy a second hand bookstore. Do you have any ideas on how to make this small business venture a positive force for good? • Be green. Natural Resource Defense Council has an article, Greening Your Business, which lists tips for making your business green like recycling, using copier and printer paper that is post-consumer and recycled, using Energy Star office equipment, and getting an energy audit. He may even be able to get his business certified as "green" like the Bay Area Green Business Program does, which could be a selling point for potential customers. • Be a community gathering space. If the space allows, be a low-cost gathering space for your community to have meetings, readings, exhibit art, post events, etc. For example, we have a small store in Oakland called Issues that sells international newspapers and magazines. They are having an art opening this week for Creativity Explored, an organization that helps adults with developmental disabilities create, exhibit and sell art. • Organize other local businesses. Create a "Buy Local" holiday shopping weekend with fellow vendors like the San Francisco Small Business Commission's Shop Local First campaign. • Donate to your community. Hold an annual fundraising event with readings and signings by local writers to benefit a literacy program at a school, nonprofit or library, or to give a grant to an aspiring local writer. • Help your community donate. Make it easy for people to give away the used books you don't want to purchase from them. Provide them with a list of places to donate to, or a collection bin that an organization picks up once a week. • Take care of yourself and your employees. Do whatever it is you need to do to enjoy running your new businesses so that you're happy at your work. Pay your employees the best wages and benefits you can. Happy sales people create happy return customers . I'm going to be honest with you. I'm a little burned out on do-goodness. August 19th is not only my 39th birthday, but also the 3rd birthday of when I started blogging about social change and nonprofit-y things, and I've hit a wall. All I want to do is read cookbooks, do yoga, and spend time with my husband. To celebrate my birthday, I was going to start the 29-Day Giving Challenge again, but it didn't feel right. I thought about making it a 29-Day Give to Myself Challenge, but that didn't feel right either. Instead I might try a middle way: a 29-Day Giving to Others, Giving to Myself Challenge. The first thing I'd like to give to myself is to learn about something new. It's time to set those books about green living, social entrepreneurship, and nonprofit technology aside for a little while. Michelle Murrain of the Zen and the Art of Nonprofit Technology pointed to an inspiring post this week in her Nonprofit Technology Link Love: Michele Martin's 10 Tips for Creating a Personal Learning Plan on the Bamboo Project Blog. Michele recommends assessing the strengths you want to develop, the weaknesses you want to mitigate, and the skills you want to develop. Based on those lists, you brainstorm some goals you'd like to achieve, and then (this is my favorite part) 1. cross off any goals that don't make you feel excited or energized, and 2. reduce your list to just two goals. 1. Learn to cook one new thing each week. I just got Nigella Lawson's Feast cookbook out from the library. For all you fellow Nigella fans, Casey Ellis of Margin Notes posted a fun little 4 Questions 4 Nigella Lawson interview last month. 2. Do yoga 2-4 times a week. I used to be a yoga teacher, so I'm comfortable doing yoga on my own at home, but I would also like to try a class at the Berkeley location of Yoga to the People, and go on some kind of not too fancy, or expensive yoga retreat. If you know of any activists, nonprofit workers, social entrepreneurs, or other changemakers who have learned to achieve a balance of giving to others, and to themselves let me know, I'd love to interview them. Flickr Photo Credit: Father's Day Gift uploaded by Breibeest.